Takeaway: Boost the performance of your grow with the latest products hitting the modern growing market. This time we are featuring gadgets and equipment from: Active Aqua, Ideal Air, ION, Reiziger, Koppert Biological Systems, and Vital Landscaping. These products are all #GoodtoGrow. New from Ideal Air is the Pro Dual series air conditioners. The Pro Dual series delivers heating and cooling in a mini-split configuration that allows for multiple indoor ceiling or wall heads and a single outdoor unit. This feature provides precise zone control: 68 degrees in one room, 76 degrees in another. All units feature auto-restart and an inverter compressor. Inverter compressor technology more effectively regulates the heating and cooling function of the unit resulting in substantive energy savings. Pro Dual Series air conditioners have an outdoor ambient cooling temperature range of -13°F to 122°F and an outdoor ambient heating temperature range of -13°F to 86°F. 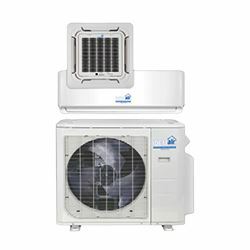 Also features ultra-efficient SEER ratings range from 21.5 to 22.5, depending on the model and a whisper-quiet operation and three-speed fan. The Pro Dual is available in two, three, and four-ton models with indoor heads from 9,000 to 24,000 BTU. 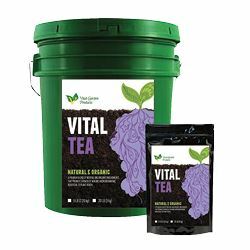 Vital Tea is a proprietary blend of high quality ingredients including: mega worm, organic compost, California gold, baseline humus, insect frass, glacial rock powder, and yucca powder. Each of these ingredients are blended and cured to perfection. These micronized organic ingredients make Vital Tea into a concentrated version of "the original compost tea." This means that smaller applications of Vital Tea go much further. Vital Tea serves as a beneficial microorganism inoculant and boosts your soil biology. Vital Tea is also packed with nutrients, micronutrients, enzymes, and humic and fulvic acids and minerals. Regular compost tea applications help your garden to fight off pests and pathogens while building your plant's immune system. Vital Tea can be used in conjunction with all nutrient programs. Many cups and awards have been won with Vital Tea applications, which can be brewed, extracted, or top-dressed. Available in five pound bags and 20-lb. buckets. 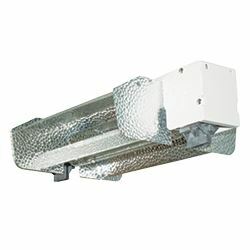 The ETL-listed ION DE Flare Reflector provides high-performance light distribution for double ended HID lamps in commercial and large growing areas. Made of 95 per cent reflective hammertone aluminum, the flare design delivers widespread uniform light for maximum canopy coverage and effective heat management. This style is perfect for overlapping footprints in multiple-light configurations. German Vossloh-Schwabe K12x30S lampholders and a heavy-duty, powder-coated, steel spine ensure long-lasting durability backed by a three-year warranty. The DE Flare Reflector also includes an ION-ballast-compatible mount, six-inch integrated lamp cord, and hanging hardware. For retailers looking to order, ION lighting is available exclusively through BWGS. Active Aqua has added two new flood tables to its product lineup. The first is the premium 4x6-foot white flood table, offering unparalleled strength and performance. The tray edge is arch formed for minimal flexing and maximum reinforcement. These tables are made of 100 per cent BPA-free virgin ABS plastic cap over recycled ABS plastic core, and are fully recyclable. They hold up to 101.5 gallons, and feature water level indicators. Those looking to keep a low profile will find Active Aqua’s 2x8-foot Low Rise Flood Tables ideally suited for top feeding and perfect for catching runoff from hydroponic set-ups. 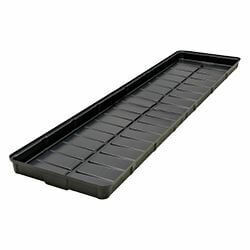 Available in black, its curved, narrow, edges allow for tighter grow space, with unique vertical channels that are sloped towards the center of the tray for efficient drainage. These tables are rigid and strong, with a low-profile 3¾-inch sidewall, and will hold up to 28 gallons. For retailers, these are available exclusively through Hydrofarm. Master the art of hydroponics with Reiziger substrates. Reiziger has a long heritage of delivering outstanding tools that meet the needs of hydroponic craftsmen. Recipes and formulas, refined over the last 30 years, have created an innovative range of solutions that started growing from the rich traditions of pedigree seed breeders in Amsterdam back in 1984. Trusted by Dutch growers for decades, Reiziger substrates are ideal for all kinds of hydroponic systems, containers or potted plants. 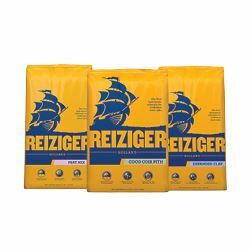 Reiziger Coconut Coir Pith, Peat Mix, and Expanded Clay have all been engineered to deliver a surge of seemingly infinite power to help short-cycle cultures in any hydroponic garden grow twice the size. Presenting a perfect marriage of commitment and enhancement, Reiziger substrates are the only substrates with the power, style, and drama to make the world of underground botanists and farmers stand still. Search for the ship on the gold bag. 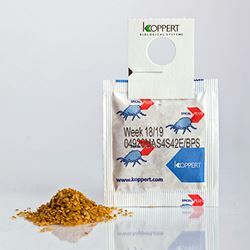 A leader in biological pest control solutions, pollination, soil stimulants and seed enhancement, Koppert Biological Systems has introduced the SPICAL-PLUS (Neoseiulus californicus) sachets. The sachets contain predatory mites and storage mites in all stages, mixed with bran. The mites breed inside the slow release sachets dispersing into your crop over a period of weeks for combined protection against spider mite, broad mite, and russet mite. Hang one sachet per plant if leaves do not touch adjoining plants or one per meter square if they do and let SPICAL mites protect your crop.